WASHINGTON — The United States Mint unveiled the winning designs in the World War I Centennial 2018 Commemorative Coin Design Competition today. The unveiling took place during the Association of the United States Army (AUSA) Annual Meeting and Exposition at the Walter E. Washington Convention Center in Washington, D.C. The designs, by LeRoy Transfield of Orem, Utah, will be featured on the obverse (heads) and reverse (tails) of the World War I Centennial Silver Dollar scheduled for release next year. 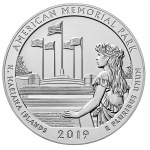 “Our team at the U.S. Mint is proud to have the honor of crafting the coin that will commemorate the contributions and the history made by American men and women of all walks of life who bravely stepped forward 100 years ago to defend the interests of the nation and that of her allies,” said Thomas Johnson, Chief of the United States Mint’s Office of Corporate Communications, who spoke at the ceremony. The obverse design, titled “Soldier’s Charge,” depicts an almost stone-like soldier gripping a rifle. Barbed wire twines in the lower right-hand side of the design. Inscriptions are LIBERTY, 1918, 2018, and IN GOD WE TRUST. The wire design element continues onto the reverse design, titled “Poppies in the Wire,” which features abstract poppies mixed in with barbed wire. Inscriptions include ONE DOLLAR, E PLURIBUS UNUM, and UNITED STATES OF AMERICA. Now retired United States Mint Sculptor-Engraver Don Everhart sculpted both designs. Additional participants in the unveiling included Under Secretary of the Army Ryan McCarthy, U.S. World War I Centennial Commission Chair Robert Dalessandro, and World War I re-enactors who unveiled the designs. The World War I American Veterans Centennial Commemorative Coin Act (Public Law 113-212) authorizes the minting and issuance of not more than 350,000 silver dollars in commemoration of the centennial of America’s involvement in World War I. A surcharge of $10 for each coin sold is authorized to be paid to the United States Foundation for the Commemoration of the World Wars to assist the World War I Centennial Commission in commemorating the centenary of World War I. Additional details about the World War I Centennial Silver Dollar will be announced prior to the coin’s release in 2018 and further information can be found on the Mint’s website. Flowers and barbed wire??? I would just once like to see a coin that is NOT politically correct. The opportunity for a great looking coin was there but once again they ruined it. I was in for 3 years and I never saw any flowers,,, especially ones that looked like those. They’re poppies.. for remembrance. If you think Americans are sensitive about the flag try being a politician in the UK not wearing a poppy. Wrong helmet, wrong jacket and wrist band, and if he don’t pull the buger-picker out of the trigger he will shoot the guy behind him, AND what is with the nose? is he a Ethnic Doughboy? Hate the design. I was wanting one to commemorate my Grandfathers service, this is not that. Oh my goodness… the profile of the soldier alone is enough to reject this design, this is an amateurish attempt to capture the element of a soldier in battle in what was said to be the “war to end all wars” at the time. There is also no indication as to what the anniversary commemorates without an adequate inscription, very disappointing choice indeed. Complete Obverse Disaster of a design. Who’s running the mint ??? This design MUST be scrapped. Nothing is historically correct. Bummer.